The jaw consists of two bones, the maxilla, or upper jaw, and mandible, or lower jaw. Pain in the lower jaw can occur from many different causes, and can be acute or chronic. Pain may also occur from conditions in the jaw bone itself or may be "referred" pain from problems in nearby regions, such as the mouth or neck. Problems that can occur within the jawbone itself include cancer, infection, fracture and necrosis, or bone death. Fractures from blunt trauma to the mandible cause pain and swelling. Osteonecrosis of the jaw occurs in some people taking bisphosphonates, drugs used to treat osteoporosis, or low bone density. Necrosis develops more frequently in people taking the drugs intravenously to treat cancer, but cases have occurred in people taking the drugs orally as well. Symptoms include tooth loss over the area of the dead bone and painful, non healing exposed area of bone, reports rheumatologist Linda Russell, M.D. of the Hospital for Special Surgery. Many problems within the mouth, teeth and gums can cause jaw pain. Cavities, abscesses, infection and broken teeth can all cause pain that may be felt in the lower jaw. TMJ, or temporomandibular joint disorders, can cause pain at the junction point of the upper and lower jawbones, known as the TMJ joint. 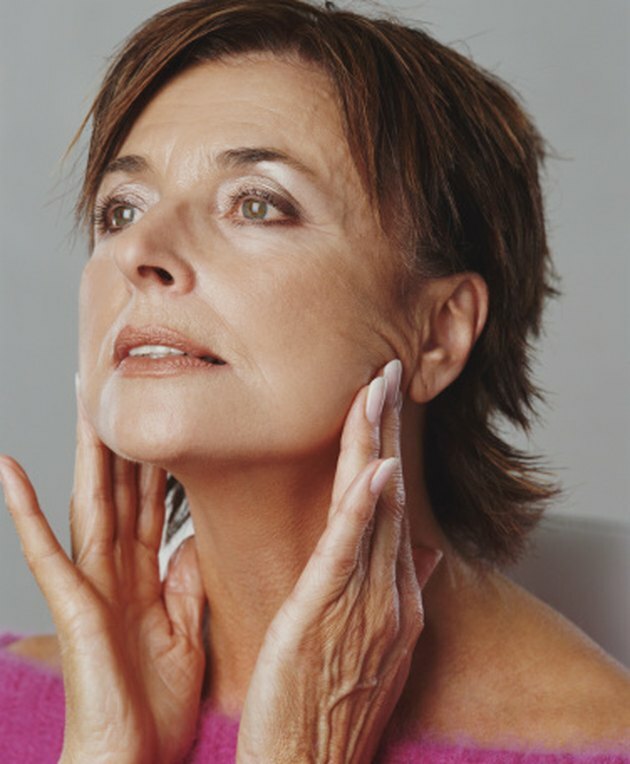 TMJ disorders occur most frequently in women between the ages of 20 and 40 to 50, according to Merck.com. Arthritis, muscle strain, problem with the cartilage in the joint, or dislocations or hypermobility in the joint can all cause TMJ pain. Tooth grinding, often considered to be a cause of TMJ pain, has not yet been proven to be a cause, reports Medline Plus. Infection in the sinuses, heart disease--including heart attack--and ear infections can all cause pain in the lower jaw, according to endodontist Joseph Dovgan, D.D.S. Problem with the facial nerves, called trigeminal neuralgia, or swollen lymph nodes in the neck may also cause referred jaw pain. Hospital for Special Surgery: Bisphosphonates and Osteonecrosis of the Jaw; Linda Russell, M.D. Endodovgan: Tooth Pain, Oral Pain; Joseph Dovgan, D.D.S. What Causes Fluid Around the Heart in Cancer Patients?